The opportunity!? Mowing the lawn isn’t usually one of my favorite pastimes but this spring I was anxious to try out my new lawnmower. No need to clean and tighten the sparkplug, check the gas and oil, and pray for the roar of exploding gasoline (within the engine) with this new mower. It’s a push mower, “push” as in your pushing gets it moving and turns the front reel that lops grass cleanly as the sharp blades rotate pass the fixed bar. Using a push mower is more than just fun, of course. It’s good for the environment. A gasoline powered lawnmower pollutes as much in an hour as a car driving 250 miles; pollution from electric corded or battery powered mowers depends on how the electricity is generated. 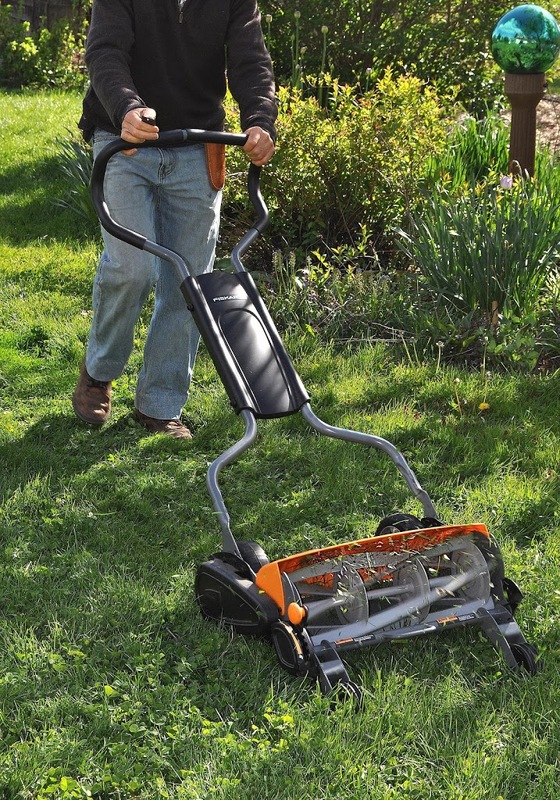 A push mower offers the opportunity for productive exercise. And reel mowers make cleaner cuts than rotary mowers so result in a healthier lawn. I highly recommend Fiskars Reel Mower. A few weeks ago I fingered possible blame for poor seed germination and poor seedling growth on my having substituted peat moss for coir in my potting mix. Coir is a sustainable byproduct of coconut processing; peat moss takes eons to form so is not sustainable. I’m happy to report that I was wrong. My seeding failures, it turns out, were due to the heating pad that is meant to provide gentle bottom heat for seed germination in my cool temperature greenhouse. Instead of the desired 75°F., the thermostat for that heating pad had been inadvertently turned up to 100°F (probably by me)! Gardening brings into play the interaction of all sorts of physical, chemical, and biological system; the interactions are complex and this complexity makes it hard to ascribe cause and effect. But gardeners too often do this, just as I did (with reservations) relating coir in my potting mix to poor seed germination and seedling growth. To really find out if “A” causes “B,” (for instance, that coir is bad for seed germination) you have to control as many variables as possible (same seeds, same light, same watering, etc.) and then apply “A” to only half of your plants. It’s often not all that easy to control other variables. And anyway, if you start out believing that something — compost tea, for example — is going to make your plants grow better, you’ll be wont to not use it on all your plants. And then, if the summer happens to be sunny and warm with timely rains, you still might be inclined to tout that something — the compost tea, in this example — for good growth. My coir blunder did have the benefit of making me more objective about what makes a good potting soil. Many years ago, after much research, I came up with my own not-secret potting soil recipe of equal parts compost, garden soil, peat, and perlite with some soybean meal and kelp thrown in for extra nitrogen and micronutrients. Coir, in my last mix, substituted for all the peat. After thinking that coir ruined my mix, I made up a batch of potting soil using 3 parts leaf mold (thoroughly rotted leaves) with one part perlite, again with some soybean meal and kelp. And then I actually did an experiment, planting half my lettuce seedlings in the leaf mold mix and the other half in the coir mix. Once removed from the overheated heating pad, seedlings grew equally well in either potting mix. Which is to say, with reference to religions or potting soils: Many roads lead to the mountaintop. A good potting mix needs to drain well, hold moisture, provide nutrients, and provide a biologically friendly environment for roots. 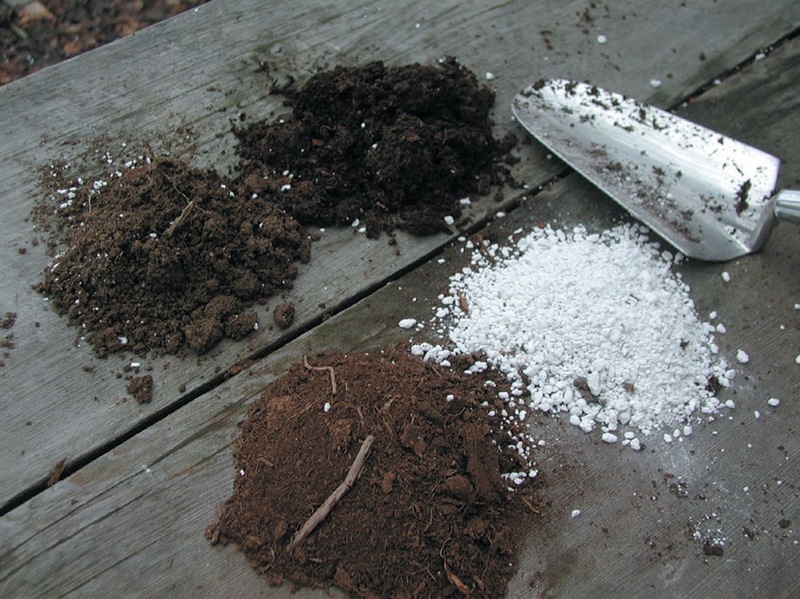 Perlite, sand or vermiculite can provide good drainage. Compost, peat, coir, or leaf mold help hold moisture and provide a biologically friendly root environment. Soil, compost, leaf mold, soybean meal, and kelp can provide nutrients. Various combinations of these ingredients make equally good potting mixes. This entry was posted in Uncategorized and tagged coir, Fiskars, peat, poor germination, potting soil, reel mower. Bookmark the permalink. Trackbacks are closed, but you can post a comment. First of all, let me thank you for this creative post. I second by all your views. Mowers are truly a cost effective way of maintaining a well trimmed and a beautiful lawn in a comparatively short duration of time. Overall, this is a great post. Good Job!